In 1955, when Alain Resnais was still working as a documentarian—a few years before his feature debut, Hiroshima Mon Amour—he made “Night And Fog,” a short film about the Holocaust that’s still a staple of cinema studies, analyzed for how it evokes horror by presenting facts and images dispassionately. 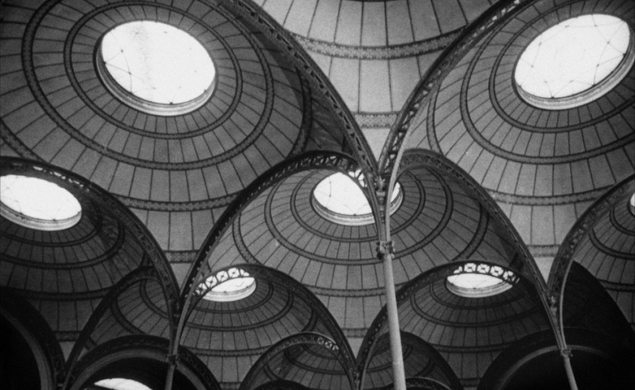 But Resnais brought just as much artistry and intellectual rigor to his next short, “Toute La Mémoire Du Monde,” shot at the Bibliothèque Nationale De France, in Paris. From an opening sequence that evokes Citizen Kane in its slow, somewhat creepy tracking shots across a storage room full of crates and papers, “Toute La Mémoire Du Monde” announces that it’s not going to be some run-of-the-mill educational film about a library. Maurice Jarre’s score also enhances the atmosphere of dread; except for a brief, whimsical passage when Jarre quotes “Singin’ In The Rain,” the music in Resnais’ film is both ominous and rhythmic, suggesting a ceaseless grind of work for the librarians who receive, sort, store, and determine the proper level of public access to the sum of human knowledge, circa 1956. Ghislain Cloquet’s black-and-white cinematography captures marvelously varied gray tones, as the camera moves relentlessly through the library’s mammoth, museum-like rooms. Meanwhile, Jacques Dumesnil’s narration lends drama to the impossible endeavor of keeping up with the unstoppable flood of culture. (Though Resnais and writer Rémo Forlani do throw in a wry joke when they wonder “what will testify most cogently to our civilization tomorrow” as the camera reveals a stack of newspaper comics.) With so much to take in, Resnais does what he did in “Night And Fog,” stepping back to get a good look at the place itself, rather than what it represents. In “Toute La Mémoire Du Monde,” that means exploring the geometry of the Bibliothèque, admiring the patterns of shelves, moldings, and shadows, while moving the camera toward places where the grids and curlicues resolves into soothing blankness.